This is a very rare bass that was made in the Fender factory in 1983. It was one of the last basses produced at the Fullerton plant. 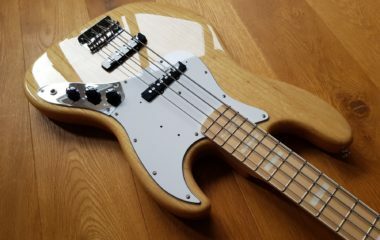 Fender was in the process of being sold, and it has been well documented that instruments at that time were made using parts that were available. This is a great example – the neck has dot inlays but also a bound fingerboard with a bullet truss rod adjuster at the nut. It’s also features a 3-bolt neck with micro-tilt adjuster. Around this time Fender were switching to a 3 screw bridge, but this one still has the 5 screw type. This fits in with the age of the bass. Although is has a “S8” serial number (S = Seventies, 8 = 1978) it actually left the factory early in 1983. The pots date to 1982, but the neck is dated early January 1983 which makes it a 1983 bass. Also of interest is the bakelite pointer style knobs which had been discontinued in the late 1970’s. Make no mistake though, this bass is exactly as it left the factory. It’s very similar to the bass featured on page 79 of “The Fender Bass – an illustrated History” and is a rare find. I’ve never seen another one like it. It can’t have been played much. 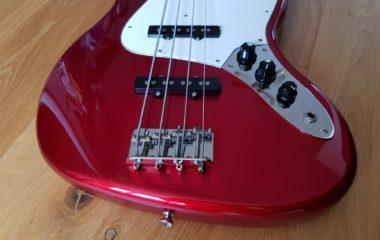 The neck is super straight, the truss rod turns smoothly in both directions and the bass has a great low action. It’s very playable and has that superb Jazz tone. All 100% original and correct. It comes in the original shaped hard case (Not a Fender one) A rewarding instrument to play and a solid investment too. 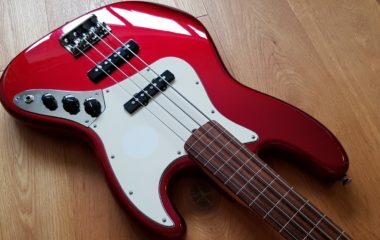 A quality vintage Japanese made bass in remarkable condition..